Canon Powershot A610 digital camera introduction : Canon, a leader in photographic and imaging technology, today announces its latest high performance compact digital still cameras, the PowerShot A610. With 5.0 Megapixels, the camera incorporates a host of high-end features normally reserved for G-series PowerShots. DIGIC II processors drive a fast, responsive performance, and - in combination with the cameras' 4x optical zoom lens - deliver superior image quality. A wide range of manual, automatic and special scene modes offer flexibility, creative control, and simplicity when required. The camera also features a 2.0" vari-angle LCD, My Colors, and a macro mode that allows photographers to get as close as 1 cm. VGA movies at 30 fps can also be created with the Canon A610. A complete range of optional accessories, including wide and tele-converters and waterproof case, extends shooting flexibility. A comprehensive software suite is provided as standard. 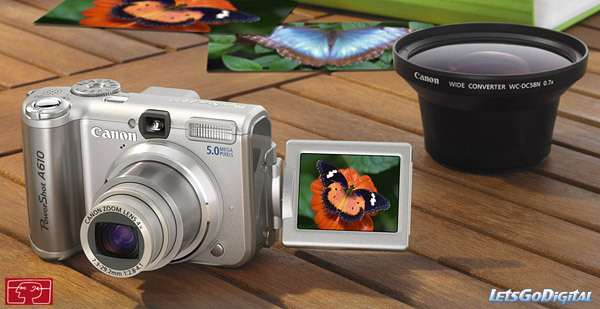 The Powershot A610 is equipped with a Print/Share button, PictBridge printing as well as ID Photo Print and Movie Print. USB 2.0 Hi-Speed connections provide for high-speed transfer of image data. Canon Powershot A610 - G-series performance : Replacing the popular PowerShot A95, the new camera has been given a serious performance boost. While the A610 features a 5.0 Megapixel CCD sensor, the delivering image quality is suitable for detailed photo prints up to A3 size and allowing substantial cropping without loss of print quality. "We regard the PowerShot A610 as a mini-G camera - offering G-series performance, but retaining an A-series price," said Mogens Jensen, Head of Canon Consumer Imaging Europe. "With an impressive range of high-end features, the Canon A610 camera offers photography enthusiasts advanced control and flexibility." Powershot A610 - Canon zoom lens : Precision Canon zoom lens in this new Powershot camera follows the design and construction of G-series lenses, with eight elements in seven groups, and incorporating two aspherical elements. The upgrade to a 4x optical zoom provides a 35 - 140 mm focal length (35 mm equivalent). With a maximum aperture range of f/2.8 (W) to f/4.1 (T), the lens is impressively bright at the telephoto end. In addition, focusing performance in low light has improved by up to 2-stops, resulting in greater freedom when shooting in dim conditions. The lens' spectral characteristics has been optimised specifically for the configuration of the lens and sensor, providing accurate colours and significantly reducing the chromatic aberrations (such as purple fringing) often found with lower quality lenses. The addition of Canon's advanced DIGIC II image processor results in a faster and more responsive camera that delivers improved image quality. Focusing time has been cut by around 60%, and shutter lag is negligible at no more than 0.1 seconds. Smooth continuous shooting is now available at approximately 2.4 fps for the A610. With DIGIC II's superior assessment of white balance, colour rendition accuracy is increased. The new PowerShot A610 features Canon's 9-point AiAF for fast, accurate focusing even when subjects are not centred. FlexiZone AF/AE allows free scrolling anywhere within the frame's auto focus area to select the desired subject, for which exposure is weighted accordingly. Manual focus selection is also available. 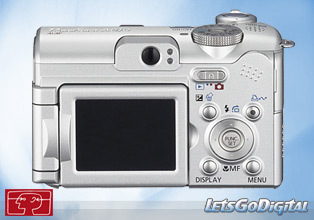 Canon Powershot A610 - Increased versatility : A larger 2.0" vari-angle LCD offers users great versatility in composing shots from awkward angles, such as from ground or waist level, above the head and when shooting self portraits. The selectable grid line display helps with composition and levelling horizons. The Canon A610 incorporates a total of 20 shooting modes, including full Manual mode, a Custom mode for allocating preferred shooting settings, and a shutter speed priority mode, with shutter speeds ranging from 15 seconds to 1/2500 second. Eight scene modes - such as Night Snapshot, Snow and Underwater - maximise results in a variety of shooting situations. 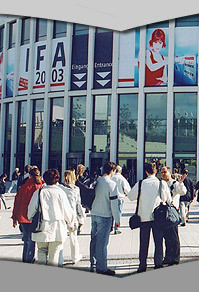 The Stitch Assist mode facilitates shooting pictures for panoramas, which can be joined together easily with the supplied PhotoStitch software. My Colors - located on the mode dial - allows the expansion of creativity in digital photography. Special effects, such as Color Swap or Custom Color, which allows users to select their preferred colour balance for any given shot, can be performed in-camera and viewed on the LCD while shooting stills and movies. These effects could previously only be achieved using PC software after shooting. High quality movies are selectable from VGA (30/15fps), QVGA (30/15fps), Fast Frame Rate (for slow motion replays in camera), and Compact mode (for clips that are ideal for emailing). Canon A610 - Accessories to enhance : A complete range of optional accessories is available to extend the capabilities of the Canon Powershot A610 camera. The new Conversion Lens Adapter LA-DC58F, has been designed to fit this camera. Both the Wide Converter Lens WC-DC58N (0.7x) and Tele-converter lens TC-DC58N (1.75x) increase framing options and extend the camera's effective focal length range. The dedicated Waterproof Case WP-DC90 - submersible to 40 m - is constructed with anti-fog double glass and a flash light diffusion plate. Separate Waterproof Case Weights WW-DC1 are available for controlling buoyancy. Other accessories include the AC Adapter Kit ACK600, Battery Charger Kit CBK4-200 with four NiMH batteries, and the Soft Case DCC-300. 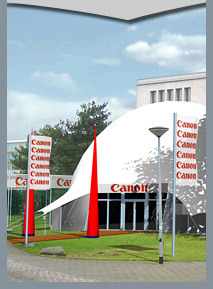 Canon Powershot A610 - Advanced printing : When used in combination with Canon's new Compact Photo Printer SELPHY CP510 and Canon’s Ink and Paper Set (KP-108IP), prints can be produced for just 30 euro cents each. Printing via SELPHY CP Compact Photo Printers also allows the user to print handy ID Photo prints and movie prints. When connected to the latest range of PictBridge compatible PIXMA printers (also released today), image enhancement is possible with functions such as Noise Reduction and Vivid Photo, as well as the new Face Brightener feature. Also new is Captured Info print, which prints shooting data such as shutter speed, aperture and shooting mode within the photo border. Printing images without having to connect to a PC is kept simple with the Print/Share button, which also acts as an easy upload button for Windows XP and Mac OS X.
Canon A610 camera - Comprehensive software : The Canon Powershot A610 compact camera comes bundled with a comprehensive software suite, including Canon's browsing and printing software ZoomBrowser EX 5.5 (Windows) and ImageBrowser 5.5 (Mac), easy printing software PhotoRecord 2.2 and PhotoStitch 3.1 for creating stunning panoramas. Also included is the photo manipulation software, ArcSoft PhotoStudio. Purchasers of the camera are eligible for membership of CANON iMAGE GATEWAY , which offers 100MB of online space for uploading and sharing images, and supports My Camera, which allows users to further customise their camera settings. Supported operating systems are Windows 98 (SE), Me, 2000 (SP4), XP (SP1/2) and Mac OS X v10.2-v10.3. The cameras support PTP for driverless transfer to supported Windows XP or Mac OS X.